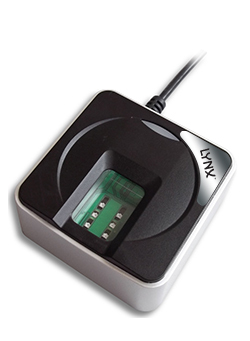 LS88H is an enhanced version of LS80H USB2.0 Fingerprint Scanner from LYNX. It was certified by FBI to be compliant with PIV-071006 Image Quality Specification (view PDF) for Single Finger Reader. So LS88H meets the US Federal Information Processing Standard 201(FIPS 201) for Personal Identification Verification (PIV) of Federal Employees and Contractors. It is also listed in the US General Services Administration (GSA) FIPS 201 Evaluation Program Approved Product List. LS88H uses advanced CMOS sensor technology and precise optical system to meet the rigorous requirement on fingerprint image quality of PIV-071006. Its fingerprint scanning window is crown glass with a thickness of 14mm that resists scratches and other stress to ensure long term heavy duty usage. It is a robust but cost effective single finger capture device and ideal for border control, identity card, driver license, election and any type of civilian AFIS application. Special electronic circuit is built into LS88H to do Live Finger Detection (LFD). With appropriate software in PC, user can select this LFD feature so that only live finger’s fingerprint will be scanned into PC. Fake fingers made from silicone rubber, play-doh, etc, will be rejected. And the LFD feature is included in all LYNX standard software. A unique serial number is factory-programmed into the USB Device Descriptor of each LS88H. So every LS88H is traceable and this is very important for government identity management projects. Please contact LYNX for more details. LS89H is OEM module of LS88H for customers who want to integrate LS88H into their own products, such as handheld POS machine, portable voter registration station, etc. LS89H is same as LS88H but without plastic shell and USB cable so that it can be embedded into any target system. It does not support Live Finger Detection(LFD). Please contact LYNX for detail mechanical drawing.